Make roasted tomatoes at the end of summer or in the early fall when tomatoes are ripe and abundant. I like to serve these warm with fresh mozzarella or goat cheese, spread on bread or crostini. They are also good tucked into a sandwich or fashioned into a sauce for pasta. 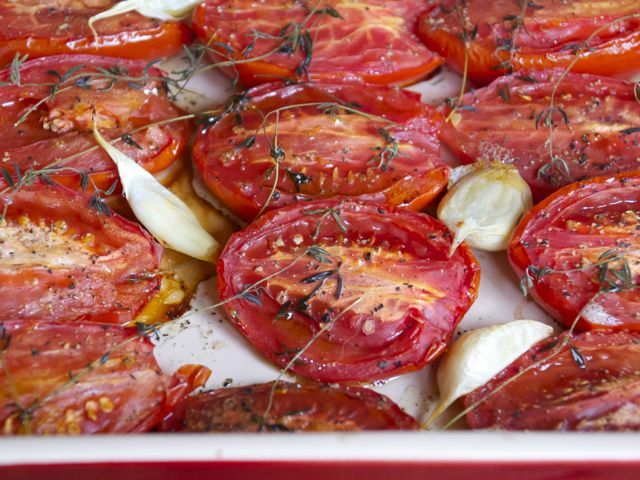 Slice the tomatoes in half lengthwise and arrange in a baking pan, cut side up, in a single layer. Drizzle with the olive oil, then sprinkle with salt and a fresh grinding of black pepper. Strew thyme branches over the tomatoes, and tuck in the garlic cloves. Cook for about 90 minutes, checking every 30, until the tomatoes are beginning to shrivel on the edges. To serve as an appetizer: Drizzle the roasted tomatoes with additional olive oil. Squeeze the garlic from their skins and spread them on baguette slices. Add a smear or slice of cheese to each baguette slice and top with a roasted tomato. To save a little summer for later, you can double or triple this recipe, then freeze: Pack cooled tomatoes in small freezer plastic bags, squeeze out any air, seal, and lay flat on the floor of your freezer, stacking as many bags as you have. This creates nice, flat bags that don't take up much room in the freezer.